Have you ever wondered that? I sure have. If this website Elie Wiesel Cons The World is telling lies about him, it would be the natural thing to do. In the same vein, if Elie Wiesel has the number A7713 tattooed on his arm, as he says he does, it would be very easy to show it to the world and put me out of business. It is inexplicable that he doesn’t do it if he could. The only logical conclusion to reach is that he can’t … because he doesn’t. Not only does Elie Wiesel not sue me, he doesn’t go after Nikolaus Grüner either, who called him a liar before I did. Grüner did try to sue Elie Wiesel, though, but was prevented from doing so by the courts and legal systems that protect Wiesel according to Zionist orders. I’m told the United States Holocaust Memorial Museum closely follows this blog. I have said many negative things about the museum, too. For instance, that it is a criminal conspiracy to defraud the American people — certainly to defraud the American taxpayers out of fifty or so million dollars a year. I have accused the USHMM of blatant lying, of perpetuating false information even after it knows it is false, of creating an atmosphere of hate against anyone Jews don’t like. And, yes, of being totally run by Jews for Jewish interests — not the interests of history — very similar to the OSI (Office of Special Investigations) in it’s disreputable and downright illegal tactics. I will be doing a new article on the relationship between these organizations — in 2010 the OSI was merged into the Human Rights and Special Prosecutions Section of the Domestic Security Section of the Justice Dept. I have previously written about the symbiotic connection between Elie Wiesel and the national holocaust museum he was instrumental in creating in this country – the USA. Built in Washington D.C. on federal ground amidst the national monuments to American history, this parasitical monstrosity pretends to be something that helps to insure the American idea of freedom and democratic principles around the world! Did you know the USHMM was closely following your blog? Two weeks ago, I landed on the Oral History site; I did not intend to watch the VDO, but scrolling down the page, saw there was a clickable link to the transcript of the interview in .doc or .pdf format. That’s quite handy and I downloaded a couple every day till the 26th, when I posted my comment [here at EWCTW] with a link to their site on one of the rare pages without a clickable link. Guess what? – on the evening of the very same day each and every link had been disabled. Well these testimonies have been recorded in the late 80s or early 90s, before the advent of the net and they believed they could get away with telling anything … (Bomba tells he dug a bunker in the ghetto for 50-60 people, loading it with food for 2 YEARS, apparently in a matter of days … to fifth-graders). I am not surprised at that. I too see changes based on what is exposed on Elie Wiesel Cons The World. Just one example is Wiesel’s now more secret visits to Chapman University after I so effectively panned his first visit as a “Distinguished Presidential Fellow” in March 2011, based simply on what I read in the local and campus newspapers. We also had a fellow, Steve, pass out flyers at a Wiesel talk during that same visit. Since then, Wiesel’s visits and talks have been handled differently. In his 2012 visit to Chapman, there was no publicity and Wiesel only appeared to students in very private and secure settings. So far, there have been no announcements of his 2013 visit that I have seen. So they react, but they are careful not to ever mention this web site or my name in any way. To object in any way about it or me would mean they would have to show, demonstrate, prove, provide evidence or give testimony that I am wrong. They know beforehand they cannot do that because they know they are the liars, not me. They depend on the news and entertainment media to keep the public believing they have noble aims. I would have to say that Elie Wiesel and the USHMM are afraid to touch this web site because of the deep research I have done, to which they have no answers or rebuttal. Without the power of the media covering for them, and all branches of the U.S. government backing them, they would wither and die from their lack of credibility. The powers that are behind Elie Wiesel and the USHMM know that they can only succeed by using generalizations like “hate,” “genocide,” “anti-Semitism,” “religious persecution,” “6 million,” etc. along with such vague “legal” language as “stirring up racial hatred” and “encouraging contempt for individuals or groups”. No legal system that has acquiesced to what the Jews want in the way of protections for themselves will allow for introduction of evidence that actually pertains to truth or falsehood of specific elements of the narrative. Both Elie Wiesel and the USHMM make specific charges against those they call the perpetrators of evil, but they will never answer to the denial by said “perpetrators” that they committed these evils. Via the total postwar power assumed by the victors of World War II (those who brought about WWII in order to gain this power! ), this question was never allowed consideration. Again, it was the media that did the job. 1) n. to publish in print (including pictures), writing or broadcast through radio, television or film, an untruth about another which will do harm to that person or his/her reputation, by tending to bring the target into ridicule, hatred, scorn or contempt of others. What I do here seems to fit that (apart from the word “untruth”), but there is no response from those who are so targeted. Of course, my intention is to discover and to tell the truth, not to slander. The only complaints I get are a few comments, and once in awhile an email, from ardent fans of Elie who chastise me for being insensitive to the man’s suffering — which to their illogic means to them he can have no reason to lie about it and would only tell the truth. (And if he doesn’t, well – that is excused on the same grounds.) To their thinking, Jewish suffering excuses all moral failings. These writers are mostly female and young, appearing as though they had looked up Elie Wiesel on the Internet, come upon this site and were shocked by it. Unfortunately, these young’uns would be the first to use the “chosen method” described above, that is, to judge harm done according to “selected” peoples’ feelings. That is the only way anyone will ever touch it. 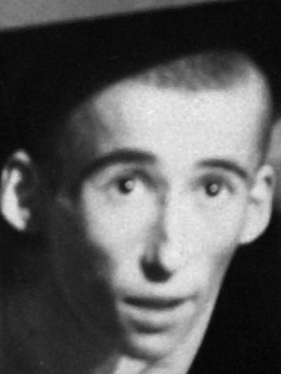 Our reader took advantage of the website’s free demonstration offer and tested two faces from the famous Buchenwald liberation photo taken on April 16, 1945. Nikolaus Grüner is in the lower left of the FBLPhoto, and in the background is the round-headed man who is claimed to be Elie Wiesel. These are the results the computer program gave him. This does not surprise us. It fits what we can see with our natural eyes and brain — and what other evidence has told us. But it’s nice to know that a program designed by the bright folks at Apple has confirmed it. In this video, Nikolaus or Miklos (Michael) Grüner is being interviewed by the Modesto (Calif.) Bee while the photographer films him pointing out the tattoo on his left arm. This is shown in the very beginning of the video; right after that we see the famous “Buchenwald Liberation” photograph we’ve become so familiar with, and 16-year-old Grüner is in the lower left hand corner. Is Elie in the photo? No. In 2008, Grüner traveled to California from his home in Sweden. While there, this very important bit of video was produced but has not been given the attention it deserves. I wonder why. Notice I didn’t form that as a question since I think the answer is apparent: If Grüner has a tattoo, why doesn’t Wiesel? 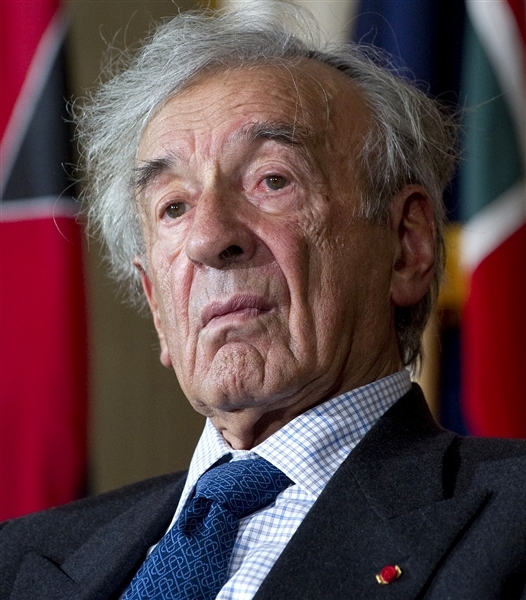 According to Elie Wiesel, he and his family were deported to Auschwitz in the same time period that Grüner and his family were–in May/June of 1944. They both tell a similar story of arrival at Auschwitz-Birkenau, the men being separated from the women whom they never saw again. After a period of adjustment, they were transferred to Monowitz-Buna where they lived and worked until January 1945, when both say they were transferred to Buchenwald. They also both say in their respective books that they were given a tattoo on their left forearm while at Birkenau – Wiesel the number A-7713 and Grüner A-11104. Gruner’s tattoo looks like a real tattoo to me. It looks very similar to the one in this picture at right of Sam Rosenzweig’s arm, which I have posted previously and is the best example of an Auschwitz tattoo I have found. According to George Rosenthal, writing for the Jewish Virtual Library, and accepted by the USHMM, Sam’s tattoo represents the “regular” series of numbers used at Auschwitz from 1940, while the “A” series was first issued in May 1944. So we have evidence from Grüner and the photograph above of what Elie Wiesel should have on his arm, but doesn’t. There is no point in “Wiesel Believers” continuing to make excuses or look for reasons why their hero Elie won’t come clean about his bare arms. We know he has no tattoo where it is supposed to be … or anyplace! Just look at the top of this website. 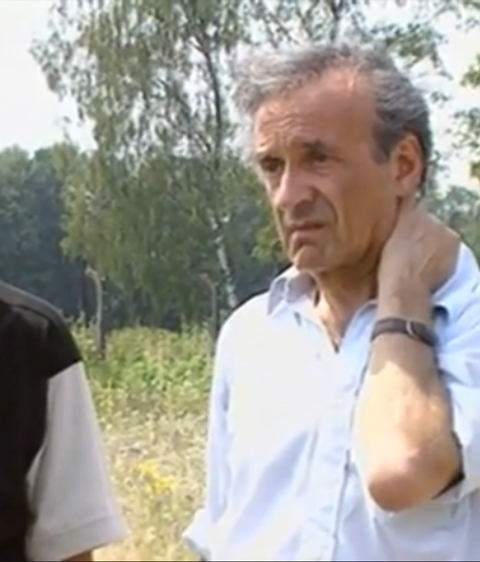 Or the photo below … from the 1996 documentary film “Elie Wiesel Goes Home.” We see his left arm in bright sunlight; clearly there is nothing on it. In the film we can see his right arm too, many times, which also has nothing on it. What more is there to be said? It’s a slam-dunk, and there is nary a word coming from the Wiesel camp about it. Isn’t it about time? Yes, but nothing happens unless people demand it. Remember, on March 25, 2010 at the University of Dayton, a student asked Wiesel if he still has his concentration camp number and if it serves as a reminder of those terrible experiences. “I don’t need that to remember, I think about my past every day,” he responded. “But I still have it on my arm – A7713.